I was able to contact one of the many people experiencing problems with the first room transition of the game. I was able to fix this bug, among others. So, if you were anxious to play the demo, and had trouble getting into the first cave at the landing site, be sure to try v1.21. Kousoru was kind enough to share his version of the SpiderBall with me. It works in his engine, but mine handles collisions differently. I sat down this afternoon to code the SpiderBall from scratch, now it's clearly separated in specific stages (evaluate terrain, direction, execute movement, etc. ), instead of the simple system with many workarounds for slopes that was before. Now it works like it should, it flows much better than before. Anyway, the most critical bugs were solved, I'm focusing on polishing the rest of the game. I want to thank all the great people that gave their oppinions, comments and bug reports about AM2R. Your demo is amazing! Your talent is amazing~! Awesome work, doc! Glad to hear that the bug keeping people from entering the first cave has been fixed! Also that spiderball movement sure is smooth! Your devotion never ceases to amaze me. You're an inspiration, Doc. Omg your demo is AMAZING you are my hero you brought me a metroid better than zero mission. One bug i found was you can't jump and move at the same time while your beam is charged this, plz fix that. Awesome demo :D you can put other area and put a fan art of the gameover screen??? good news, just played some [not all] Hard Mode, AND I LOVED IT :D the area seems just as refreshing the last time I played the demo. Your polish to praise. when going through the options menu, I constantly have an issue with pressing a button and it doesn't respond and after a second of button mashing it finally responds responds. Grand work you have going. I look forward to your continued polish and great effort. Amazement is looked forward to. Great work, Doc. Loved the Gamma Metroid. Hope to soon see the final product. It sounds like you're actually in the home-stretch now! How long is the startup supposed to take? The game has been starting up for the last five minutes. Black screen with the disclaimer text in the corner, blue floppy disk in bottom right. That screen. I have an SSD and solid system specs. Confrontation took under a minute for me to load, and the first demo also took less than a minute, so I'm reasonably certain this is another bug again. Using a 64-bit OS, if that makes any difference. YEAHHHHHH GO DR GO!!!!! YOU CAN DO IT! 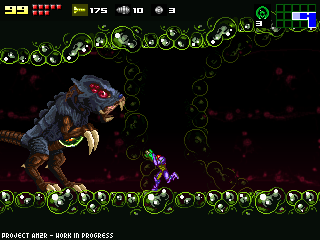 For the next areas, in your remake, why will not you take some old bosses already seen in Metroid Fusion? Words can't describe my happiness about this project! I don't speak English, so used Google translate. When Samus's remaining Energy is low,　Do you can sound for Alerts? I was kind of wondering if you could add an option to disable joypad controls. I was trying to play this version of the demo and the joypad support would not allow me to even change settings. Thank you for your consideration in this, and great job keeping this project alive for all these years. I wish I had a special clock. A clock that would take me to the day. When AM2R is ready to play. Keep up the good work! As a HUGE fan of the original Metroid 2, the demo completely blew me away! Here's to bringing it home with a full version! I feel that Metroids should be susceptible to fully-charged beam shots, in case you run out of missiles. They could do less damage, but be a viable last-resort. Played thru whole demo from start to finish (got the varia suit after everything was over :P). Got something like 82% items or something like that. Missed charge beam and had 4 energy tanks. Sadly didn't have the fourth until after the alpha metroid. This have come a LONG way since I first saw it. * The soundeffect when climbing up is just slightly too loud compared to other sfx which seem to work well. * The Chozo Robots eyes should glow red just as they are about to fire or something similar. Graphically this was superb! Very much details! Musically it was very nice to hear the classic tunes vamped up. There is room for improvement, but to me the soundtrack worked perfectly. Audio was really great. Love the reverb effect in the vertical corridor room. Mechanics like the spinners, the water engine-thingies, the booster water morphball shoot thingie were awesome and great ideas! I love the latest demo, and I'm highly impressed with all the progress that's been made with the game, including everything from the graphics to the music (I've been following the project since 2010). I hope this isn't too much to ask, but I'm wondering if you'd be willing to give your fans an update on the overall completion of the game and maybe even an ETA on the final release? What do I mean? That if you shoot something with a missile, it hits it. However, if you shoot another missile from EXACTLY the same position you did before, and walk to any direction (again, after shooting a missile), the missile will land in another place. It kind of "follows the screen". Just sits at the mostly black loading screen, with the floppy disk icon in the lower right, and the text saying how its not by Nintendo or intended for profit. Waited several minutes and nothing. you are awesome man! can you port metroid on ubuntu? I love that you fixed the area transition glitch, but now when I launch the game, it just goes to a black screen. I can see a disclaimer, and a "save" icon, and it just stays there... Not sure that's wrong. I have win7 64 bit, quad core processor, 2gb videocard, and way more than enough hard drive space (easily 400GB free). Amazing. This is simply amazing. I love this game. It has the perfect amount of balance between exploration and combat. The Metroids are tough! I love the way you hid items. It felt just like a true Metroid title. Show the Chozo statue shooting but the shot disappears, means the rock is just a hologram hiding a missile pack. Good stuff. However, I think you put the missile packs too close together. The novelty of finding them has to be just right. Did you know that Did You Know Gaming mentioned AM2R on their latest video? I just gave it a try and it's awesome. Really captures the atmosphere. The graphics are great and the controls are tight. Great remake. I just wonder why it's called a "Demo"? Hi there. I don`t know if there is somewhere to leave comments other than this so I`ll just go ahead and use it. I`ve been patiently watching you develop this game and have been anticipating it a whole lot. I just started playing your demo and all I have to say is wow. You have done an absolutely fantastic job and I am impressed with all that you have done. The game is very challenging, yet refreshing and enjoyable. I love the music that is in the game too; it adds to the ambiance of what you have created thus far perfectly. The overall feel and mixture of the whole experience truly feels like a classic Metroid game. You have done an excellent job and have my gratitude as a Metroid fan, bringing back what we loved about Metroid! Man.. U're my idol.. amazing demo..
Just discovered this project and I'm blown away and thankful. Nothing against the original Metroid 2 but to me, this version is actually playable. If for no other reason than just having a map. Makes a big difference. But of course having it play as smooth if not smoother than Metroid 3 is just awesome. My one request, and I'm not sure how feasible this is or isn't as further tweaks and edits go forward but I just finished the demo and I'm really hoping I'll be able to load my save file in future releases so as to not lose all my progress. Keep up the great work! Looking forward to new releases. I have a bug report! Sometimes, when you press enter, all of the GUI will disappear! If you grab an item, such as high jump, bomb, varia, etc. the item will fade away. You will get the item, but no messages will pop up. The terrible thing is, when you try to get to the room exit, instead of going to the next room, you fall through forever and can't do anything. And, since the GUI doesn't work, you can't restart from last save or even exit the game without using Task Manager. Just a heads up of a glitch, witch seems to be very common on my computer. Not sure about others, though. I've played and fully completed all platform metroid titles out there and I must admit that this remake can easily be placed on top of them. Personally, I cant find a single flaw. Controls are great. The theme is very mysterious and the graphics truly amazing. Hard difficulty is indeed HARD. We are looking at a great game here. I cant wait until its complete. Really great job. Hoping for an April Fools post tomorrow. Those two jokes you did a while back were hilarious. Where'd the download link go?